NEW VIDEO!!! Whipping it into shape with a fresh start for 2018 with this gorgeous dish! Hello guys! I’m sooooooo excited to share this delicious recipe with you!! I have been in my super healthy mode the last few weeks, and I’m wanting to share every recipe with you that I can. I know how many of you are taking some extra care with yourselves and your family along with me as we head into Spring and I love how excited everyone has been lately! I get so pumped up when you guys are sharing advice, tips and stories over on my Whole30 Diary page and lots of people have been inspired to start their own healthy jump start which is the best thing ever. Anyway, I will stop babbling and tell you about this dish. This GORGEOUS delicious dish! Beet Pesto, (which my girls call unicorn pesto) which I have been making for years is tossed with ZOODLES!!! 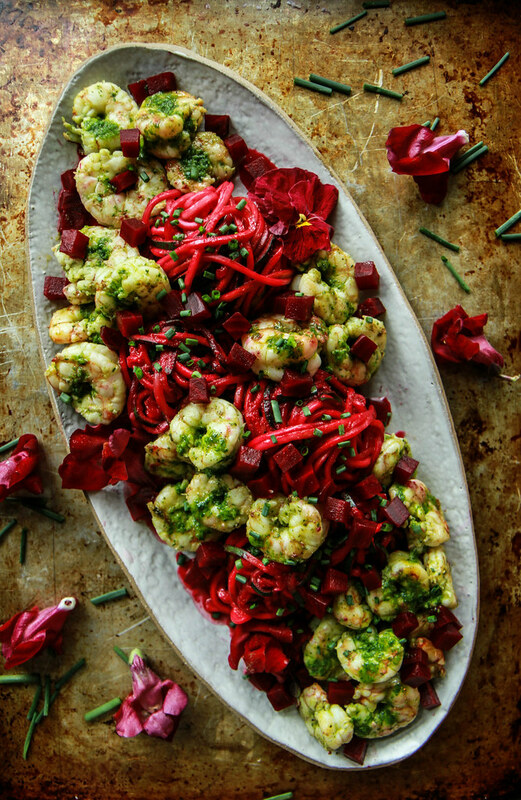 Then we top all of that super tasty and extremely healthy goodness with spicy herb shrimp. YUM. I’m making this in a live cooking class over on facebook on Tuesday the 14th at 3pm PT and I really hope you will join me! In a blender combine the garlic, jalapeno, cilantro, olive oil and vinegar. Puree on high until smooth and then season to taste with kosher salt. Add the shrimp to a Ziploc and pour ⅔ of the spicy herb sauce in. Set aside. Peel the 3 beets under cold water. Roughly chop two of them and transfer to the bowl of a food processor. Small dice the third beet and set aside. To the bowl of the food processor with the beets, add the garlic, pumpkin seeds, olive oil and vinegar and pulse until you have a smooth puree. Season to taste with kosher salt and set aside. Toss with the zoodles in a large bowl and adjust seasoning with kosher salt if needed. Transfer to a serving platter. Heat a skillet or heavy pan over high heat and then add the shrimp with marinade. Saute the shrimp until just cooked through and then add them to the zoodles. 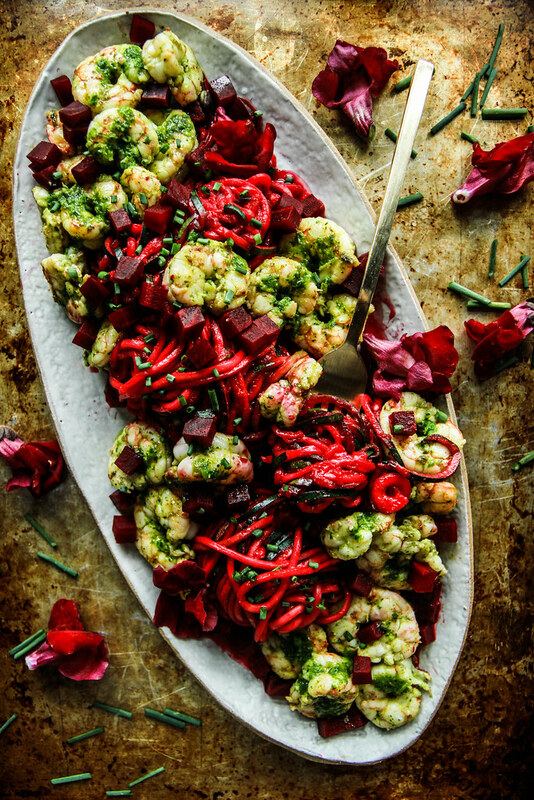 Sprinkle the dish with the diced beets and then drizzle the shrimp with the rest of the spicy herb sauce. Garnish with fresh minced chives if desired. Beet zoodles, I must try!! How pretty! Love the idea of beet zoodles! Love how bright and flavorful this is! 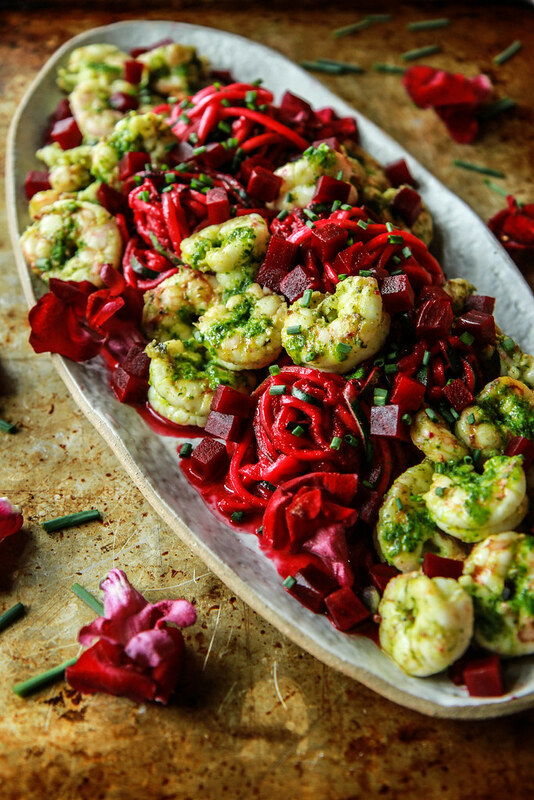 The beet zoodles are so creative and give so much color. I have to try! Just watched the video of you making this and I am totally making this today! Looks amazing!! Do you have a recipe for the spicy sauce? Hi Janice- it is there. I added a colon so it was more clear! This is one seriously gorgeous dish! Loving those beet zoodles! OMG OMG OMG! I can’t get over the colors in this dish. You make healthy food look damn good! I am all over this!! Looks gorgeous and so delicious! These are the prettiest noodles EVER!